You know those kitchen dramas you read about or see on the tele? It really happens, for real, but sometimes I wish for less of it and would prefer to breeze through the process of making something so simple, like a bucket of dark chocolate ice cream. Especially after being home only shortly after a 3-week business trip from a country advancing into a humid summer to an island currently going through some sort of a heat wave. I really wanted to just chill, literally, and wished I could stuff myself into the fridge for an hour or so instead of sweating my pants silly hovering over a flaming stove, stirring a pot of custard. But when chocolate ice cream rocks your boat, you put up with the heat, mix some ganache and cook some custard. On a 34-degrees day and all. Had this been attempted on any other week I suspect I'd end up with nothing much to report here except mix, stir, cool and freeze but being away from the kitchen too long put me slightly out of the zone. Churning out a tub of chocolate bliss took a couple of turns I didn't expect. Despite having made a custard based ice cream twice before, for some reason, I went at the egg yolk and milk mixture vigorously with a flat whisk instead of stirring it gently with a wooden spoon. My eyes weary and head quite light from all the heat both decided that the already wrongly fluffed custard needed a little while longer, after which it gloriously curdled into sweet scrambled eggs on me. That was when I looked around for the ingredients to start a second batch of custard, found just three eggs in the fridge and promptly wished I had a chicken coup underneath my sink. Many Singaporean women did 20 years ago, no joke. But who are we kidding here right? Had I a feathery chook nested in my kitchen she would sooner fall ill of heatstroke than lay me some fat eggs. Either that or her eggs would've been half-cooked beneath her and be more appropriate sitting on two pieces of toasts instead of being in my ice cream custard. So pushing aside thoughts of having some cluckity-cluck-cluck in my life, I forced myself back to reality and resigned to going down to the grocery store. They say if you can't handle the heat, get out of the kitchen. So I got back with a dozen eggs (just in case, you'll never know given the state I was in) and took a short break by doing the dishes. Then the custard was made and stirred into the chocolate beautifully. I licked off some of the spilled custard while cooling it down and knew that I chose the right recipe for my first homemade chocolate ice cream. I couldn't wait for my order of David Lebovitz's book to arrive so I made this off the recipe at the wonderful Jen Yu's Use Real Butter. The mercury reading and damned humidity, despite all my three air conditioners running on full throttle, would've driven me bonkers if I didn't have some ice cream, stat. Only the ice cream bit didn't come quite so quickly. The next evening, somewhat drowsy after making and having a very good lunch, I pulled out the thickened cold custard, removed my brand new Kitchenaid ice cream maker bowl from the freezer and happily poured the cold custard into the freezing bowl. No prizes for guessing what went wrong here, unless you want some of the ice cream (and Vijay haven't finished what's left). Still oblivious to my screw up, I went on the set up the ice cream churner attachment into the bowl, popped it underneath the mixer and pushed the power button. After a couple of *crack* *pop* *clunk* spins, the attachment went wayward and snapped sideways in the bowl. Worse still, I actually repeated the attempt to mix the now half frozen custard, again! When the attachment went off I was puzzled and stressed. I called yelled to the man of the house for help as I discovered a bent spring clip upon inspecting the top of the churning attachment. It was when Vijay was fixing the now deformed churner that I finally came to my senses. The machine should be on and spinning before the custard goes in. Brilliant. By that time, the freezer bowl had thawed and after churning for 20 minutes all I got was a marginally thicker custard instead of a soft serve mixture. So we had to wait for another day before all things could be made better with two three scoops of frozen chocolate cream, just as is, not requiring anything else. Luckily for us ice cream maker attachment was still working so the future of our frozen dessert making remains bright. Should you decide to churn a batch of this for yourself (and I strongly suggest you do), unless it's currently you know, winter where you live, in which case you and I can't really be friends for now, all I can offer as advice is - double the recipe. One quart would only make all things better for awhile. You don't want to be staring into that empty cup, wishing you've stirred more custard. Adapted barely from Jennifer Yu's Use Real Butter, original recipe from The Perfect Scoop by David Lebovitz. Note: Changes I made to the recipe are using whipping cream instead of heavy cream and dark chocolate instead of bittersweet chocolate. 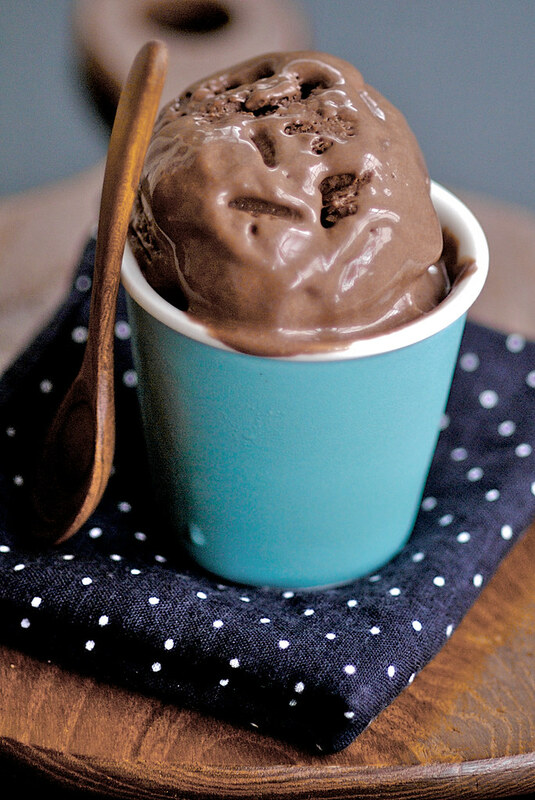 There's enough sugar in this recipe to handle dark chocolate and enough cream to produce a decadent ice cream, just stick to full fat whipping cream. 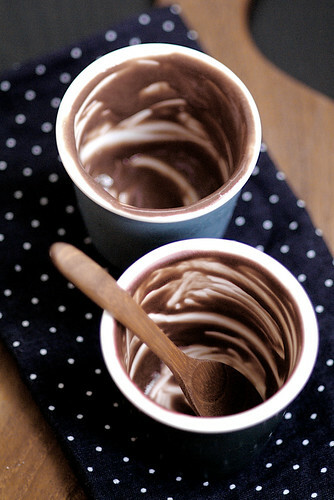 Place the chopped chocolate in a large heatproof bowl. Warm 1 cup of the cream with cocoa powder in medium saucepan, whisking to thoroughly blend the cocoa. Bring to boil then reduce heat and gently simmer for 30 seconds, whisking constantly. Remove from heat and pour the mixture over the chopped chocolate, scraping the saucepan clean as much as possible. Let stand for about 1 minute. 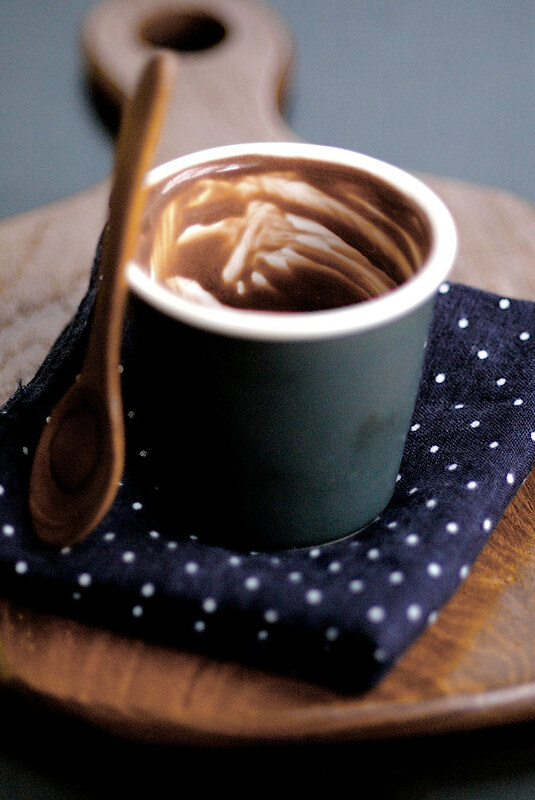 Stir the ganache until smooth. Add in the remaining cup of cream and mix well. Place a mesh strainer atop the bowl and set aside. Warm the milk, sugar and salt in the same saucepan. In a separate medium bowl, whisk together the egg yolks. Slowly pour the warm milk into the egg yolks, whisking lightly but constantly, then scrape the warmed yolks back into the saucepan. Switch to a wooden spoon and stir the mixture constantly over medium heat, making sure to scrape the bottom and corners of the pan. Stir until the mixture thickens and reaches nappe consistency (the custard should coat the back of the spoon). Pour custard through the strainer into the chocolate mixture and stir until smooth, then add in the vanilla. Continue to stir over an ice bath until cool. Refrigerate the mixture to cool thoroughly (I let it cool overnight). Freeze the custard in your ice cream machine following the manufacturer’s instructions. If you don't have an ice cream machine, freeze and mix the custard periodically as per the instructions in this French vanilla ice cream recipe. I almost 'destroyed' my KA once when I did not fix my whisk attachment properly. Luckily no big damage done - just a little bent whisk which I managed to sort out later. Ultimately - the ice cream maker with a built in freezer would be the dream gadget to have in the kitchen. 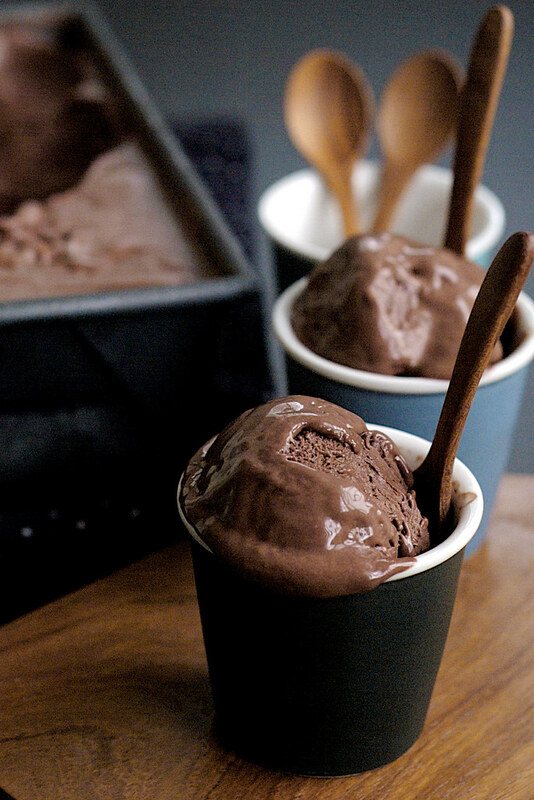 Wow, this recipe yields some really rich looking chocolate ice cream. anh: I wanna be where you are and I know I wouldn't mind some of this if I were you either. Do you have a good pandan coconut milk ice cream recipe you can share? Shirley: The KA is actually quite hardy, the only thing I haven't used up till now is the bread hook. I wish I'd given it more thought before getting the ice cream maker attachment though. I don't think it'll work well in our weather. I modified the recipe to use regular whipping cream and it's still great. I think the chocolate and cocoa makes all the difference. He has a killer sorbet recipe as well. The reason why I still like homemade ice cream is for this reason, we use the best ingredients in our custards. Paula: Enjoy! Now I gotta go and get me some more as well. oh the drama you had to deal with in the kitchen. but alas, the reward appears to have been worth it. i would've flipped had my ice cream maker made such noises. luckily for me, as of late, there are TWO different types of ice cream makers in the abode & so doubling recipes (or even better, DIFFERENT flavors) would be no issue. Lan: TWO ice cream makers? That's it. I'm getting another one, maybe Cuisine Art. Xiaolu: Thanks! I have many good examples to learn from, you being one of them. Really liked your honesty (and humor) in this post. I've been making ice cream in Penang for the past year, so I can totally relate to your struggles. The only ice cream machine for sale in Penang was a Kenmore one, which is by far the flimsiest of the ice cream makers on the market, so it can't churn too long, but it gets the job done (the inner bowl did crack a few months back, but luckily the warrant covered it. I think the humidity warms the bowl up too fast). I'm impressed with the photos, since I always have a problem with the ice cream melting before I get the lens cap off. I'm working on a new ice cream recipe right now, so I'll be blasting the air conditioner tomorrow for a few hours. How do you like this ice cream? I mean, is it too rich and sweet? I find that David's recipes use too many egg yolks and sugar. Maybe it's just me. Good luck with your future ice cream making adventures. Don't worry, it gets easier (but unfortunately, all the dish washing doesn't). Mark: My KitchenAid attachment doesn't impress me as well, I guess in our weather we'll have to get a machine which insulates the bowl well while churning, or get a self fridging unit. That investment will have to come later for me, I'm still missing a food processor. Perhaps you should come down to SG to get a new machine? Regarding the photos, although I have three air conditioned rooms, I don't shoot my food in those due to space constraint (small HDB flat). So in my sauna shoebox kitchen, you can see the ice cream melting away with each shot. The trick which will help ever so slightly is (if you're not already doing it) to shoot empty cups/vessels with your set up first before getting the ice cream out. David's recipe works for me. I use good quality chocolate so this one is actually on the bitter side. I'm good with rich ice creams as long as the flavor comes through although I see a lot of people complain about 'tasting too much eggs' in custard based ice creams. The key is to use good quality and concentrated ingredients for the flavoring I think, otherwise I also really like gelato recipes with less yolk and more inverted sugars which also freeze better. Carolyn: You may use the images as long as there's a link back. The recipe is David Lebovitz's so if you do post the recipe you may link to his book. Thanks. Just saw this on Pinterest. All I can say is Wow! 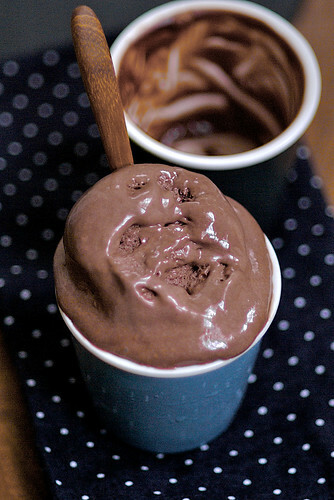 This looks amazing, and I will be busting out my ice cream maker to make it ASAP! EA: You have to make this. It's EVIL! The photos are great and the ice cream really looks enticing to eat. I am really gonna do this.Thanks for the recipe, gotta try this at home. 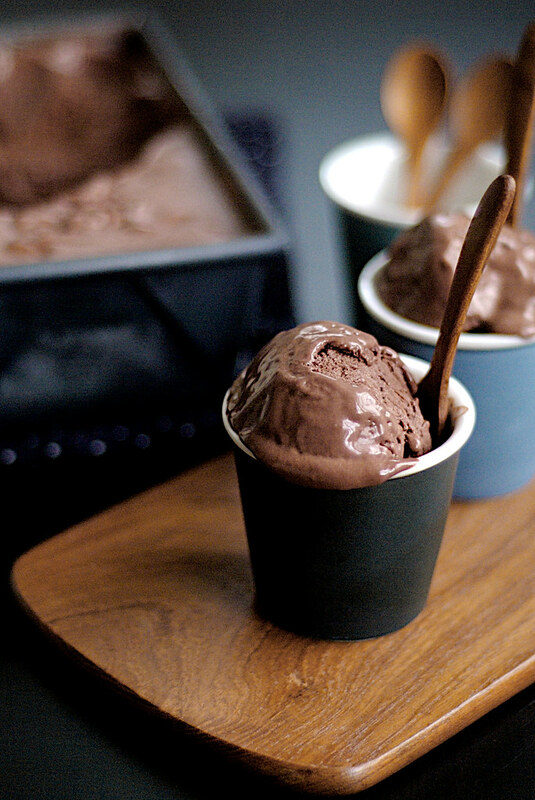 Wondering where you purchased these beautiful ice cream cups? Your pics are gorgeous and I can't wait to try the recipe. Thx! Kristie: I bought the cups from a bookshop at the Hong Kong airport. Have fun with the recipes!